Various examination Problem Topics have been identified by the North Carolina Real Estate Commission where previous applicant testable knowledge was relatively weak. Food for thought; if a critical content topic has been identified as an examination Problem Topic by the Commission – should applicants expect to see the content on the NC Real Estate Broker License Examination? Yes!!! Be Prepared!!! 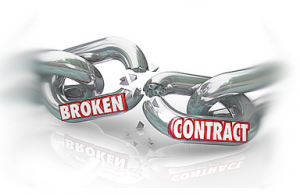 A breach of contract is a violation of the terms of a legal agreement; default. Breach of contract allows the non-breaching party to rescind the contract, sue for damages, or sue for performance of the contract. EXAMPLE: Buyer contracts with Seller to purchase a property. When the closing date arrives, Seller refuses to convey title to the property. Seller’s action is not supported by any special conditions in the sales contract and therefore constitutes a breach of contract. Compensatory Damages. The Buyer may sue breaching party (Seller) for money damages. Liquidated Damages. A specific amount of damages recoverable by Buyer, (actually either party depending which party breached the contract! ), which the parties agreed to at the time they entered the contract. Specific Performance. When the Seller breaches the sales contract by refusing to go through with the sale, purchaser may force seller to honor contract and convey the property. Because every parcel of real estate is unique, a suit brought by the buyer against the seller may be successful IF buyer can demonstrate the property is unique and/or rare. Rescission. A remedy declares a contract invalid and returns parties to the position they were in prior to entering into the contract. To learn more about contract terminations, remedies and nonperformance, and the six (6) Agency Relationship questions you WILL see on the National section of the NC Real Estate Broker License Examination, – join your colleagues at one of our many live class offerings.